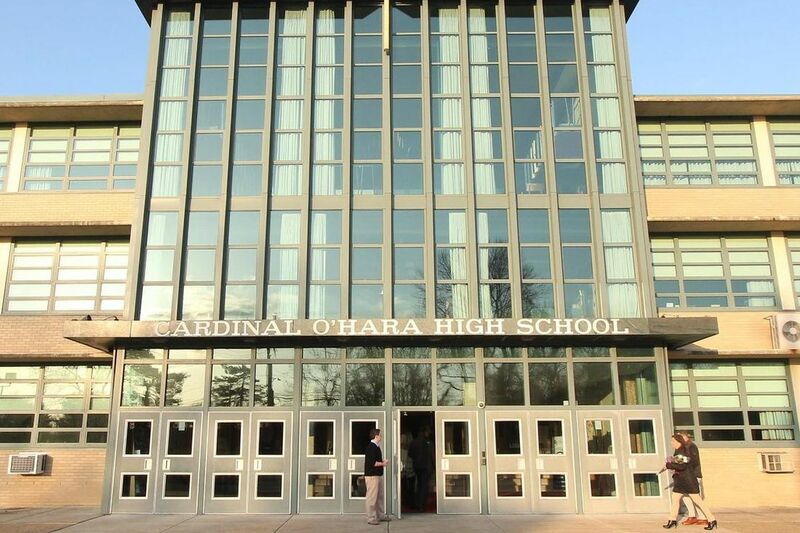 Cardinal O'Hara High School, in Delaware County. For the second year in a row, contract talks aimed at averting a teachers' strike before the start of classes at 17 Philadelphia-area Catholic high schools are going down to the wire. Negotiators for the 650-member Association of Catholic Teachers and the Archdiocese of Philadelphia have scheduled a series of last-minute talks ahead of Wednesday's scheduled start of school for roughly 12,000 students, with major issues around pay and health-care costs still unresolved. "The most important thing for us is that schools continue, because our jobs are dependent on the schools continuing," said union president Rita Schwartz, referring to the long-term financial issues that area Catholic schools have been confronting. "We're certainly not going to ask for anything that is crazy." Schwartz said teachers expect a pay raise and protection against rising medical costs. Last year's agreement, continuing a recent trend of one-year deals, gave teachers a $1,200 across-the-board raise. The teachers' 15 percent share of medical premiums stayed the same. Currently, pay for the unionized Catholic high school teachers starts at $39,800 and rises to a top of $80,505, which requires a doctorate and 40 years' experience. Without a doctorate, the top pay is about $79,000, and Schwartz said about 10 percent of teachers are at that level. A 20-year veteran makes $54,480, with about half the membership serving that long, according to Schwartz. The archdiocese said in a statement that the Office of Catholic Education "strives to provide the best possible compensation and benefits package." It said the proposals "ensure that no teacher will experience a rise in cost for health benefits. Salaries for high school teachers in the Archdiocese of Philadelphia are consistently ranked among the top in the nation, according to the annual survey completed by the National Association of Catholic School Teachers." The two sides bargained last year past the contract's expiration and through Labor Day weekend before reaching an agreement the day before classes resumed. The last time Philadelphia-area Catholic high school teachers walked out was 2011, when a strike disrupted much of the first two weeks of school. That job action took place when the schools in Philadelphia and four suburban counties in Pennsylvania were still under the direct control of the archdiocese. The following year, the nonprofit Faith in the Future Foundation took over operations of the schools, with a mission of halting a long-running decline in enrollment while containing costs. The archdiocese retained responsibility for negotiating contracts. Schwartz isn't guaranteeing a repeat of last year's brinkmanship, saying that if she took the current archdiocese offer to her membership, "It would not be acceptable, absolutely not." But she added that "nobody wants a strike." The current contract expires at 12:01 a.m. Saturday. There have been 13 negotiating sessions since April 10, according to the archdiocese. The sides have tentatively scheduled four bargaining sessions for Thursday through Monday, with the hope that a new agreement will be in place ahead of a general union membership meeting to be held at 10 a.m. Tuesday at the Sheet Metal Workers Local 19 facility on Columbus Boulevard. The teachers voted to authorize a strike, if necessary, in May. Teachers are scheduled to return to school on Tuesday for organizational meetings. "Assuming we have a contract approval, they'll go back," Schwartz said. Schwartz said talks have gone up to the deadline in the last couple of years because the archdiocese has insisted on renegotiating the entire contract – including provisions covering working conditions — and not just salary and benefits. She added that the union would love to come to an agreement that goes beyond one year. "What happens is, we can't seem to make the second year work financially," Schwartz said. "I can't take back something to the teachers that I know they're not going to accept." Students enrolled at parish and regional Catholic elementary schools in the archdiocese are not affected by the negotiations. Their teachers are not unionized.